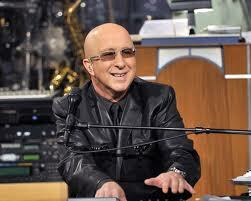 Paul has become a great friend of the Eagle, through our association with Paul Shaffer's Day in Rock program. Paul is a world-renowned bandleader and has been David Letterman's musical director and sidekick for the past 30 years. Shaffer spent five years with the original "Saturday Night Live," during which he played keyboards, composed special musical material, co-founded The Blues Brothers, and was a featured performer (which included his unforgettable Don Kirshner impression). Shaffer composed the LATE SHOW theme song and co-wrote the timeless classic “It’s Raining Men”, and has recorded with such diverse artists as Diana Ross, Yoko Ono and Robert Plant's Honeydrippers, in addition to his own albums, "Coast to Coast" (1989) and "The World's Most Dangerous Party" (1993). He's appeared in numerous feature films, including "This Is Spinal Tap" and authored the best-selling memoir We'll Be Here For the Rest of Our Lives.